2N Access Unit Fingerprint Reader provides maximum security for entry control. A comprehensive biometric access control device, Access Unit Fingerprint Reader uses an optical sensor to read fingerprints rapidly and accurately without requiring you to press down. All you need to do is place your finger on the sensor. 2N has developed an advanced algorithm to detect false fingerprints, improving security that much more. When adding a fingerprint, the user's fingerprint is scanned three consecutive times for optimal accuracy. Because 2N Access Unit Fingerprint Reader is an IP solution, you only need to connect it using an Ethernet cable for network connectivity and power using PoE. Manage it through the network, including remote configuration. 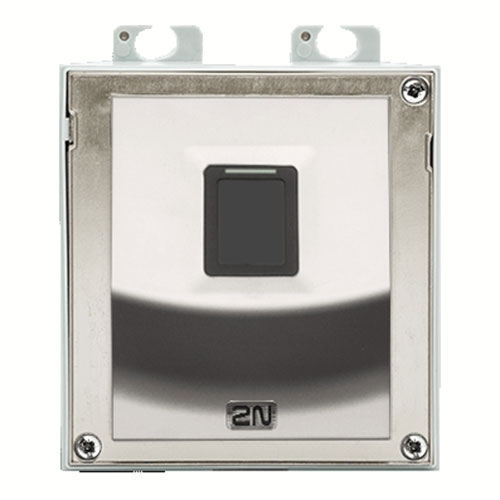 It is suitable for indoor or outdoor installations and is IP54 rated against the elements. 2N 01367-001 used to be known as 2N 916019.